[The following is stolen shamelessly from the February 9, 2012, version of "The Shooting Wire". It is presented here because it so completely illustrates that which those of us who regularly compete in USPSA (or IPSC) matches so often contend: Practical Pistol Shooting is not only NOT a demonstration of a negative attitude toward the sanctity of human life, but the joy of competition can be a positive energy even when the rest of your life may be personally challenging; it can and probably will be one of the best things you can do for yourself. I believe that this article may be an excellent illustration of this concept. On a personal level, when I learned that my Significant Other and Best Friend (and shooting partner for the previous ten years) "SWMBO", had been diagnosed with incurable cancer, I didn't want to be anywhere with her. She convinced me that I needed to continue my interest, for the sake of my own health. And indeed I learned that the friends we had made there ... in matches around the state and around the country ... were supportive rather than morbidly curious. Since her death in November, 2010, it has been difficult for me to be around people; but through my continuing (if sometimes minimal) activity in the sport, I've learned that outside activities are important for "survivors". And every month I'm becoming more acceptive to "having a life". I don't know about you, but I found Stacy Maillet's story to be not only uplifting, but she has helped me to understand that it's okay for me to spend a weekend with my friends and to enjoy my life in the activities which are familiar and even comforting to me. I need this stuff. Apparently, Stacy does too. I completely understand what she is saying in the accompanying article, and I'm so pleased for her that she has been willing to "indulge" herself, to find meaning in her life outside of her family and the difficulties with her son, and to rediscover herself through a sporting activity which some people may not understand because of their own inability to comprehend that we cannot live our lives through our family members. We need to continue to live. I want to live my life. We all need to get all the goodness from our lives that we can. Today's feature by Stacy Maillet first appeared on the WomenOfUSPSA.com blog. In December of 2011 I was asked to speak at a support group for parents of newly diagnosed children with Autism. I have a 3 year old with this devastating diagnosis. I talked about the daily struggles with Autism and how draining it can all be. I talked about my child's erratic behaviors, and how every little milestone is like a quantum leap for my son. I shared a few laughs and some tears. I shared the story of my journey with my son to a room of complete strangers. I explained that right now their lives may feel turned upside down, but they would find the strength to do whatever needed to be done for their child. They would make it through this trying time and learn to embrace their child for every morsel of who they are. I told the mothers how important it would become for them to have an outlet; to find something that they love to do, something that will bring them moments of peace and a timeout from their crazy world. I assured them this this would be the most important thing they could do for their child and themselves. A few moments later it was time for Q&A. The moms all went around and started telling each other about what their outlets were. Most said "yoga" or "meditation", a few said "running". Then it happened - I was still standing at the podium and a mother asked me, "What do you do for an outlet?". I was all prepared to say something "normal" like all the other mothers, but then I just blurted it out; "I shoot guns," I said. You could have heard a pin drop in that room as I stepped down from the podium. The look of disbelief and shock was enough to make me want to crawl under a chair. I know some of the women thought I was some kind of crazy person, and shame on me for keeping guns in my house with a child - let alone an Autistic child! I live in a very anti-gun state, so their reaction to my unethical past time was no surprise. There is no doubt I was the only mom in this room with a handgun under her Burberry coat. "Everything in my life after my son's diagnosis had been spiraling out of control. I felt like a victim of Autism! I felt like Autism was holding my son hostage with no intent on letting go, and everyday I embarked on a never ending journey with my son. Don't get me wrong, the rewards are endless. My son has taught me more about life, patience, acceptance and strength than I could ever teach him. I wouldn't change one thing about my life or my son! But there are times when I feel like I can't even breathe. Shooting makes me feel in control, it makes me breath, it makes me clear my head of everything other than the gun in my hand and the target that stands down range. From the moment I step on that range I forget about Autism. It's my moment!" I told them I shoot a sport called USPSA. I explained that it's a difficult task, that you have to be focused, you have to map out a plan, be accurate, very fast, and have complete control over your mind and body - much like the yoga they speak of. Most of all, shooting makes me happy! I'm not even really that good at it, but Autism has taught me that with a lot of hard work and persistence, you can achieve greatness. I told them my hope to be a top competitor someday. I also told them my dream: That one day my son will also enjoy this sport that I love so much. I told them how shooting also helped my marriage. My husband Marc and I do this hobby together, and we are even pretty competitive with each other. Our date night once a week is Wednesday night practice at our Gun Club, and any Sunday we can find a babysitter you will find us at a local match! The people we shoot with are some of the most wonderful people I have ever had the pleasure of meeting. They have rallied around my husband and me and offer a great reprieve from our hectic life. So yes, some would say the way I choose to unwind is far from typical, but nothing about my life is typical. When I was done with my long explanation of my frowned-upon hobby, one mother sitting in the first row said, "So you started shooting guns because your son has Autism?" I laughed and replied with "NO - I just started shooting more!" I went on to answer many questions from the mothers in that room about my hobby. I even exchanged phone numbers with some who were interested in hearing more. I felt GREAT when I left. Not only did I educate these moms about Autism, I also enlightened them about guns! Win, win! Last week I exchanged some emails with my Favorite Daughter-In-Law (FDAL). Fully disclosure; I have only one DAL, but I'm certain that "A" would be my favorite if I had more than one son. The lady is a keeper. My Son, "B", is in the Navy. He's a "Master at Arms" (kind of like an "MP", only full time), and for the last couple of weeks he has been taking Sniper training out-of-state. Last week she sent me some pictures of her children ... she has five ... and I was teasing her about not sending me more photographs, more often. They live over 1,000 miles away, so it's difficult for me to see any of them more than once a year. She informed me that she posts photos regularly on her FaceBook account, and in the process gently suggested that if I would only open a FaceBook account, I could see more pictures and she wouldn't have to double post them to a photo-gallery account as well. In the process, she mentioned that my son is convinced that "Facebook Is The Devil". I'm always had a good opinion of my son's judgement. Curiously, the vendor who provides the comments software seems to have lost track of who I am. Some regular readers have mentioned that they cannot add comments without providing a code. I have no idea what that's all about. Also, when I post a reply, I'm listed as "Guest" instead of being identified as my manly broadchested and charming raconteur host-self. There are few conditions so likely to render an author humble as being unrecognized by his own website. Shucks, if I wanted to be humbled, I'd go out and shoot a match with the Mighty 10mm. I actually bought another 1,000 rounds of Starline brass from Dillon this week, at a final cost (including shipping) of 17.3 cents per round. As The Hobo Brasser so kindly pointed out in a earlier comment, The Mighty Ten throws brass into the next county, so it's not the most economic competetitive option available. But the pistols shoots better than I do, and if nothing else I may serve as a good example to poor shooting skills ... as usual. I have to admit, I've missed shooting; but I also miss reliable equipment. What I do NOT miss is the slow, laborious process of reloading on what is, essentially, a single-stage press; great for rifle rounds, but not so kewl when I would prefer to shoot three matches a month at an average rate of 150+ rounds per month. And yes, I could always send my XL650 back to Dillon to be rebuilt. I've done that twice in the past three years, though, and it comes back working perfectly, until I drop a piece of brass onto the baseplate. Somehow, that seems to slow down the rotational speed of the baseplate JUST enough that it doesn not properly index, and it takes the better part of a minute to manually rotate the baseplate so it lines up with the primer feed mechanism. But I digress; here I am ranting about my inability to operate machinery, when I started out ranting about my inability to reliably manage comments here. BTW, I've received some very kind comments from several folks with whom I sometimes squad in competition, and I hope you know how much I appreciate your encouragement. I owe you all a big hug. Well, Elinor, I owe you a hug. I'm not so sure about Abbie-Normal and The Hobo Brasser. This book has a lot to offer for people who shoot in competition, and for people who want to shoot in competition, and even for people who maybe want to shoot in competition, but aren't sure what flavor or what they may be getting into. No, it doesn't talk about hunting. It's strictly about competition. However, there are chapters (especially the one specifically discussing SAFETY) which might be of interest to the non-competitive shooter. And that sets the theme for this book. It provides enough information about safety and other gun-handling topics that it will be a boon for anyone who wants to try the 'shooting sports'. 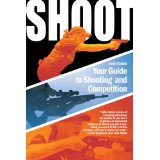 Also, there are sections in the book which will prove helpful for someone who may perhaps already be shooting competitively, but whose interests might expand to other shooting competition forms as well. For example, I've been shooting competitively for 50+ years, starting in Gallery Rifle when I was under 15 ... but I wish this information had been available to me in such a convenient book form when I was thinking about starting IPSC-style Action Pistol shooting in 1983! Interested in Sporting Clays? There's a section on it! SAS? Yup, partner, it's there ... even Mounted SAS is briefly described in Chapter 10 ("Nostalgia Shooting Sports") on page 147. I haven't gone through the whole book yet; it's the kind of book that you read the parts you know about first, to check for accuracy; then you check the 'generic' chapters (chapters 11 thru 13) to see how well the basics, fundamentals, advanced etc are covered). Then when you can't stand it any longer, you start reading about the sports which always sounded bizarre to you ... but curiously attractive. Although I'm pretty sure I'll never try Biathalon (cross-country skiing combined with rifle shooting), I found out how the game is played, what the basic rules are, and it firmed my resolve to never to cross-country ski 20 kilometers with a rifle strapped on my back. Since this blog is nominally about IPSC competition in America, I paid special attention to "extreme" sports of IPSC, USPSA, Bianchi Cup, IDPA etc. (Chapter 8) and Multigun (Chapter 9). Ms Golob, ("... An eight-year veteran of the elite U.S. Army Marksmanship Unit .... more than 115 championships titles ...") got it right in everything that I've read so far. I was especially impressed with her chapter on safety (and also on gun-handling skills). In fact, I am so impressed that I will be taking her book with me when I teach my monthly "Introduction to USPSA" classes, and strongly encouraging the students to buy and read the book. I think that hearing the same information from a more established source would help them to understand that EVERYBODY employs the same practices, and plays by the same rules. I can tell folks what they should and should not do, and I can clearly define the reasons for the rules and the penalty for violating a safety rule. But what do I know? I'm just a washed up old B-class shooter, and everyone knows that "B-class is the Elephant's Graveyard for Mediocre Shooters". When people read the same cautionary notes as written by a champion, it has a lot more impact. More, this book doesn't place so much emphasis on the negative side (Match Disqualification) of violating safety rules. Instead, it clearly defines the rules of safe gun handling and makes a simple but eloquent case for why all competitors must be aware of, and always follow these rules. It's not just the law; it's a good idea! There are a couple of awkwardly worded passages in the book; the one which caught my attention was her advice on foot placement when shooting 'weak hand' vs 'strong hand', but I think that was because she used several terms interchangeably, and the copy editor didn't catch it. I know that Ms Golob knows the difference, because I've seen her shoot and nobody with her wide range of competitive experience doesn't know how to shoot weak-hand! The above two paragraphs are included for the sake of establishing that I have critically read the book. It doesn't mean that I understand all the nuances of the sports with which I am not familiar, of course. And if I don't say anything critical, you might think I'm saying nice things about the author only because I have watched her career performances for a few years, and I'm really impressed. But if you buy and read the book, you just might enjoy trying out one or two of the competitive shooting sports you learn about. Oh, just buy the book. If you don't like it, I'll buy it back from you and hand it out to new shooters here in Oregon.